I’ve been making fries, like the ones in this post, for about 1 year and 1/2 now. Like other times in my life, I’ve come across a better way to make them. And this is a case of learning on the job. These potato wedges make my french fries look so average! And you won’t believe the trick I learned to make them crispy outside and soft inside without frying them! First, pre-heat your oven to 425 and then fill a medium sized pot with water and bring it to a boil. Next you’ll need to peel your potatoes. For two of us, I used four small-medium russet potatoes. After peeling them slice them in half, then again, and then again. So you’ll have 8 pieces for each potato. Once you have cut all your potatoes, add your potatoes to the pot. By boiling them first, we are allowing them to cook so that the inside will be soft and the outside will remain crispy from the oven. While the potatoes boil, its a great time to get your other ingredients ready. I like to blend all my seasonings together and then add them at once to the potatoes. For this seasoning mixture, you’ll need 1 1/2 tsp onion powder, 1 tsp garlic salt 1/2 tsp garlic powder, 1/2 tsp pepper, and 1 1/2 tsp chili powder. Yes, chili powder is the great and secret ingredient to these potato wedges! After about 5-7 minutes in the pot, drain your potatoes and let cool slightly. For the next step, you’ll be putting them into a plastic bag, so you won’t want them boiling hot for that! Grab a bowl and a gallon sized plastic bag. Roll over the edges so its easy to add to the bag. Then carefully add the hot potatoes to the bag. Make sure they aren’t too hot, otherwise they will melt the plastic. Whoops! Then grab your olive oil and add around 2-3 tablespoons. I eyeballed it and just added it straight from the bottle. Don’t do this unless you are familiar with the speed that the oil comes out of the bottle. First, shake up the potatoes with the oil. 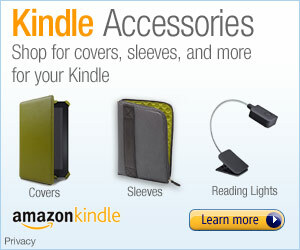 The bag will be hot to the touch, so use caution when handling it. 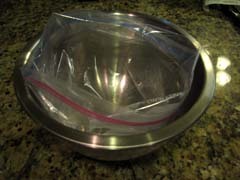 After the potatoes are evenly covered with oil, place the bag back in the bowl, open it back up, and roll the edges again. Now add the dry seasoning mixture from earlier. The potato wedges should look like this once they are fully and evenly covered with oil and seasoning. Open the bag and then wiggle the bag across a cookie sheet to get all the wedges out in the most mess free, and fastest way possible. And then separate them before they go into the oven. Put them in the oven for 20 minutes. If you’re not too busy, get them a flip half way through. Another trick for crispier skin is to put them under the broiler for about 2 minutes before you take them out. I left them in about 10 seconds too long, but my husband loves burnt things (go figure – he loves it when I burn stuff??). These are so good, you can eat them without ketchup! They’d also be great with a chipolte ranch or BBQ sauce. Sometimes, having leftover chicken in the fridge is the perfect answer to a quick weeknight meal. Simply shred or chop up the chicken breast. Next, add your favorite veggies. I like to add tomatoes and cucumber. If I have it, I’ll add avocado, blue cheese or feta crumbles, and even granny smith apples. You can also add some hard boiled egg too. We use spinach for our greens, but you can use any that you like. We prefer spinach for the nutrients and health benefits. And for dressing, well that’s when this salad goes from average to amazing. First swiftly whisk together 2 parts lemon juice with one part olive oil. Next add 2 tablespoons vinegar, 1 tsp garlic salt, 1tsp onion powder, and a dash of pepper. Note, those measurements are for 2 servings for entree sized salads. You might want to adjust to your own tastes and preferences. We like vinegar, so I tend to add some more towards the end. If you don’t have lemon, you can substitute lime, but it will obviously result in a different flavor. I also added some parsley for additional flavor. For me, food tastes as good as it looks – so presentation is everything. Even for a quick and simple meal like this. Sure, I could have tossed all the ingredients together. But when I came up with the idea of serving my meat and potato loving husband an entree salad for dinner, I knew I needed a better plan. So a-l-a-cobb-like-salad, I lined the ingredients up in thick, colorful lines. I also used serving bowls as opposed to a regular sized bowl or plate. Picture below is my salad with chicken, tomatoes, cucumber, granny smith apples, and mozzarella cheese (not my first choice, but had no other cheese on hand). Make your dressing beforehand and let sit while you assemble the salad. Or better yet, make the dressing in the morning and let the flavors incorporate while you’re away. Either way, keep the dressing in the fridge until right before you serve. No one wants soggy lettuce! This can be a really healthy and light meal too. Its totally refreshing to feast on fresh ingredients like raw spinach and apples and feel full. Let me know how you like it in the comments below. Enjoy! With some leftover ham after Christmas, just sitting all nicely flavored with honey and sliced for easy use, I just had to create something for lunch. Using a reduced fat cheddar, 10 grain bread, and dijon, this sandwich is much healthier than most restaurant paninis. 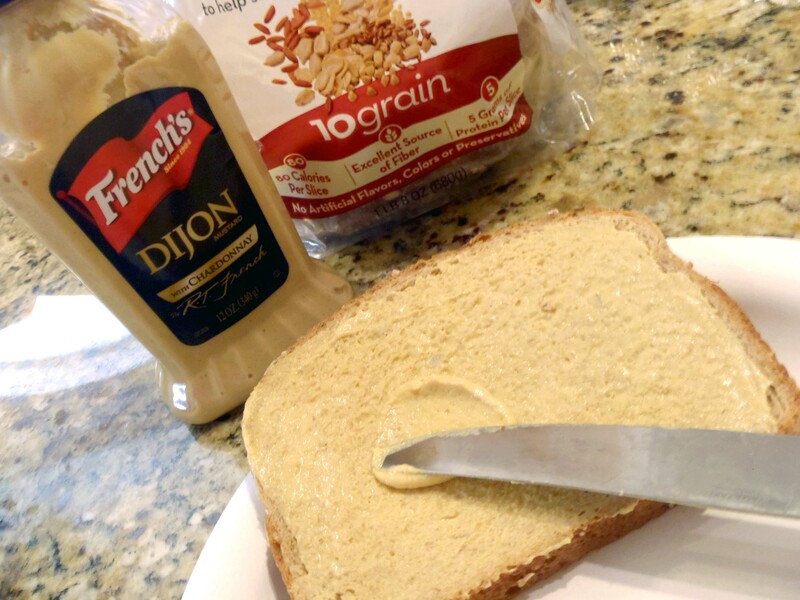 First, I grabbed some dijon mustard and 10 grain bread. Next I grabbed the yummy leftover ham. We bought the ham to make “egg stuff” for breakfast on Christmas morning. 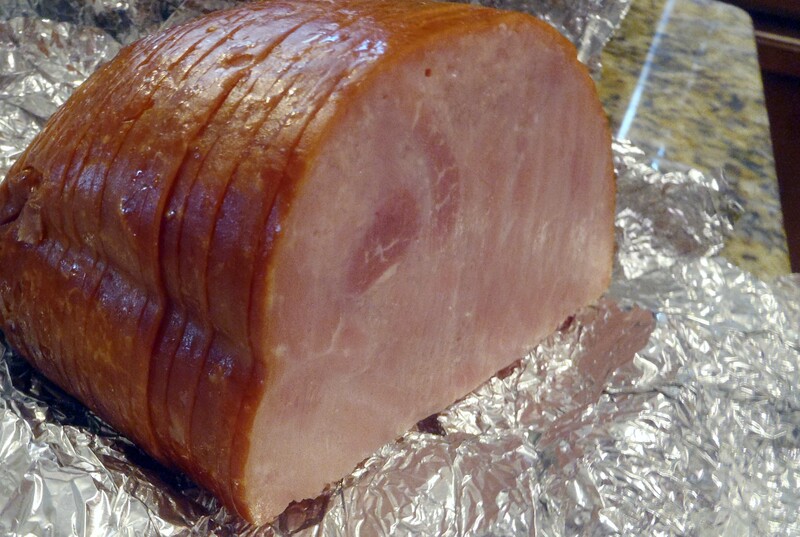 Usually we use sausage, but this ham looked so good to us. For reference, it was a Smithfield boneless ham, about 4 lbs. It was my first time buying ham like this, and tasted similar to the Honeybaked Ham that I’ve had with my husband’s family. Next I sliced up some tomatoes and got my grill ready. 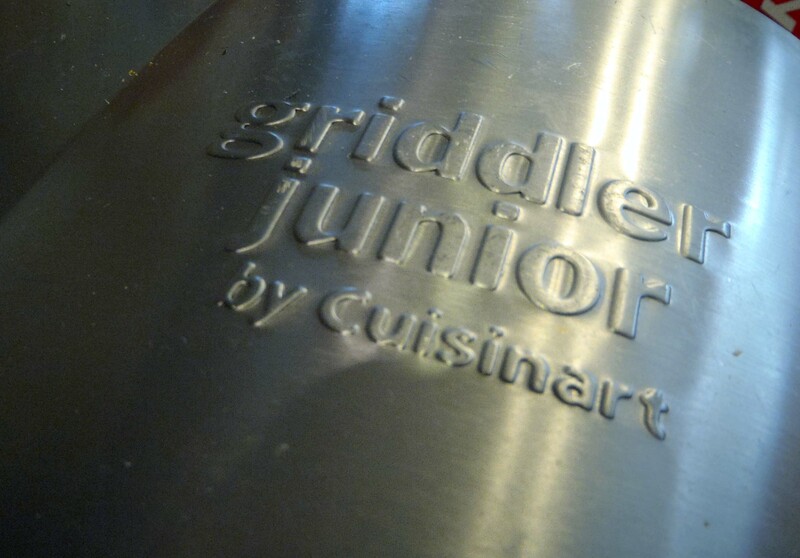 I don’t have a panini maker, but I have a griddler junior. It’s a mediocre substitute for an outdoor grill. 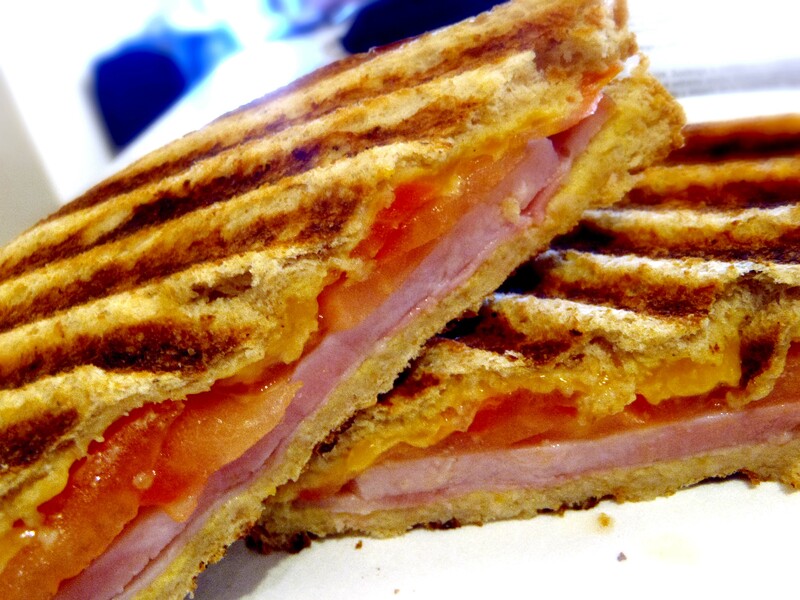 But its great for quick chicken dinners and easy panini lunches! Once my grill was heated nice and hot. I sprayed it with some non-stick spray. This grill is also made to accommodate meats cooking on both side and has a spring that allows you to fit thick foods without squishing them. 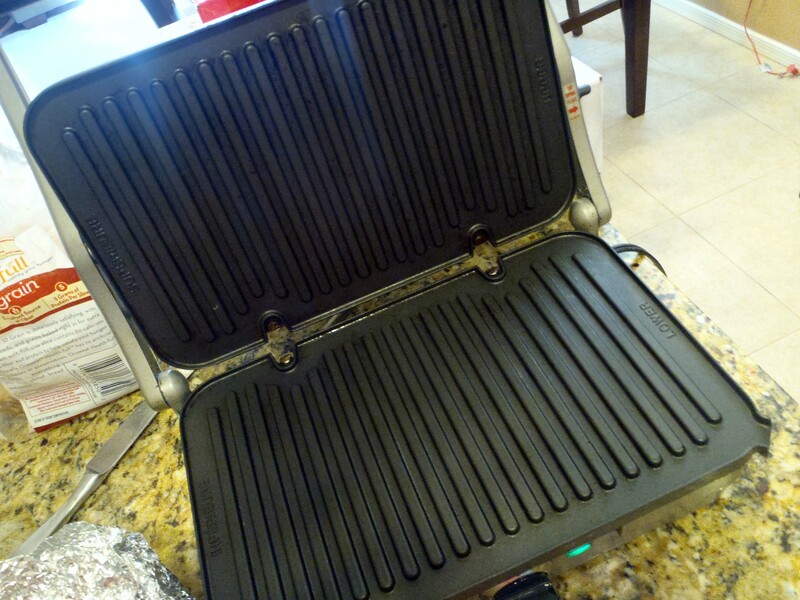 To make life easy, I recommend doing a final assembly of the panini on the grill. I put down the first slice of bread with dijon and ham. 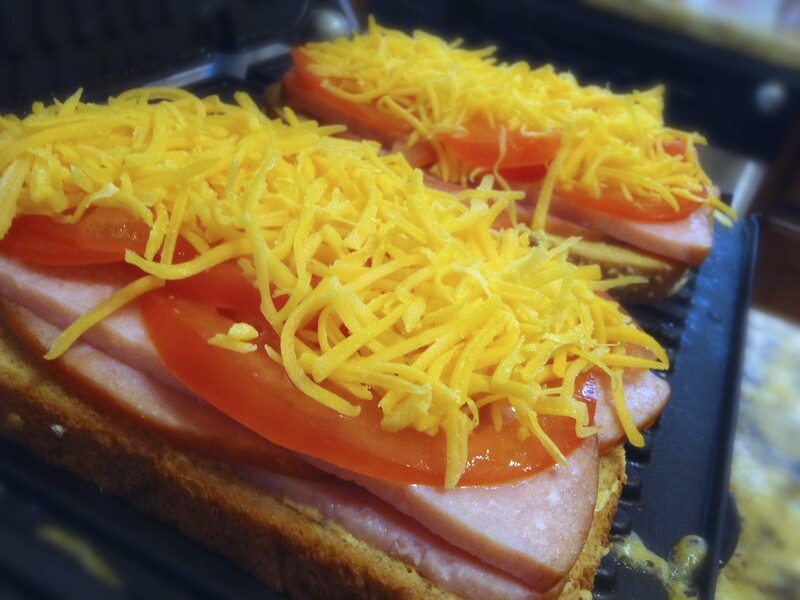 I then topped them both with tomatoes and then finally some cheddar cheese. And after the second slice of bread, I closed the lid for even cooking and quick cheese melting. After only five minutes, the bread was a toasty golden brown and the ham was nice and hot, covered in gooey cheddar cheese. I couldn’t wait to eat it! Of course, you could do a lot of different variations with this sandwich. Use your meat and veggies and sauce of choice. Just be sure not to pile the fillings too high!